Powerday has a long and successful track record in waste management and associated services. The company has been trading since 1977, its original business supplying plant and labour to the construction sector. During the 1980’s and ‘90’s, the company evolved into an integrated waste management business and has over the last 8 years invested significantly in the development of modern state-of-the-art recycling plant, facilities, vehicles and equipment. 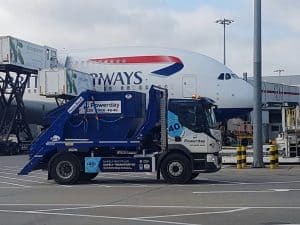 “With the guidelines set out by FORs we have been able to reduce the number of accidents with the introduction of safety cameras and FORs driver training (SUD), we cannot forget the financial benefits that the FORS Standard brings to the business in the form of reduced insurance premiums, fuel usage. PCN’s and driver incidents”. Powerday first became aware of FORs in 2012 from TFL’s promotion of the scheme. Powerday was extremely keen to benefit from the standard laid out by FOR’s, such as road safety initiatives. By joining the scheme, we were able to achieve “Best Practice”. Powerday passed the initial Bronze audit first time and encouraged us that we were on the right tracks and able to go even further. Progression to Silver and then Gold was our aim from the outset as we wanted to be a leader in providing a safe and productive fleet operation. To hold the Gold standard is seen as very prestigious and showed our customers that our operation is managed at the highest level possible. Powerday Plc carries out 6 monthly eyesight checks, ad-hoc drug & alcohol testing. Powerday employs a company called Hampton Knight to monitor health & fitness reviews of all employees including drivers. Powerday in conjunction with The RLC Foundation are encouraging ex-military personnel to develop a career in heavy good vehicle driving. We currently have one apprentice employed and are currently engaged recruiting more apprentices. Powerday are also running a program with Berkley group providing young people with work experience placements. 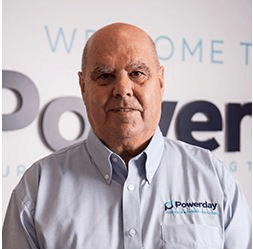 Powerday Plc has imposed a pre-7am restriction on movement of vehicles within our depots. All skip vehicles are fitted with chain sleeves to reduce noise on deliveries and collections. All vehicles are fitted with anti-idling devices. Our fleet of vehicles are Euro 6. Our Old Oak Sidings depot has Rail and Canal heads allowing us when possible to divert waste from coming in by road i.e. companies such as Laing O’Rourke, Barratts and the Berkley Group. Having Gold accreditation means to Powerday that we are fully committed to the highest standards of road transport operations, safety of vulnerable road users and our corporate social responsibility. The benefits gained by being Gold accredited have included a significant reduction in insurance premiums. To hold the Gold standard is very prestigious and shows our customers that our operation is managed at the highest level possible. Other benefits to the company have included reduced fuel consumption and lower emissions. We wish to maintain the FORs Gold standard for years to come and be a flagship company for the FORs brand.